Browse our collection of 69 Talladega Nights T-shirts, Phonecases and more. Designed and printed in the USA. 100% Satisfaction Guaranteed. About this Design I didn't chose the camp life, the camp life chose me. I love the outdoors, and so it was sorta my choice to chose the all the gear I had to buy, and how to get out here but still, the camp, hiking and outdoors life chose me. If you were also chosen by the mountains and outdoors this awesome hiking and camping phone case featuring a tent in the woods night time is the right thing for traveling in the forest! Happy trails! I didn't chose the camp life, the camp life chose me. I love the outdoors, and so it was sorta my choice to chose the all the gear I had to buy, and how to get out here but still, the camp, hiking and outdoors life chose me. 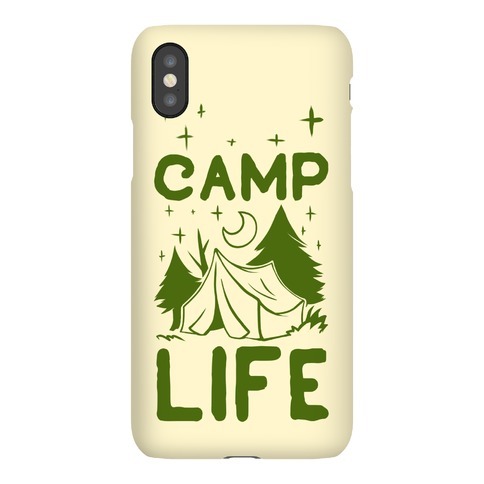 If you were also chosen by the mountains and outdoors this awesome hiking and camping phone case featuring a tent in the woods night time is the right thing for traveling in the forest! Happy trails! About this Design What better way to relax on the weekends than with a cool beer in you hands, celebrating with friends, and partying on until the night is no more? Celebrate St. Patrick's day the right way! With this beer shirt you're sure to celebrate the green holiday like a true Irishmen! What better way to relax on the weekends than with a cool beer in you hands, celebrating with friends, and partying on until the night is no more? Celebrate St. Patrick's day the right way! 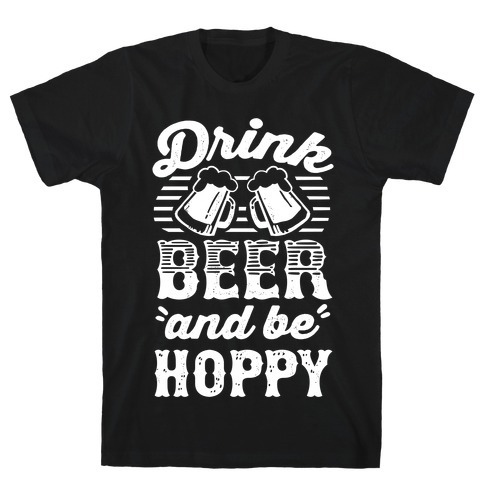 With this beer shirt you're sure to celebrate the green holiday like a true Irishmen! About this Design Shove that cartoonish image of democrats right in republican's faces with this political t shirt perfect for democrats looking to support their political party this election or for literal, actual, gay hippy vampire pagans just lookin to do what they do- be it support equal rights, save the environment, stay up all night, or do pagan stuff with their pagan friends. 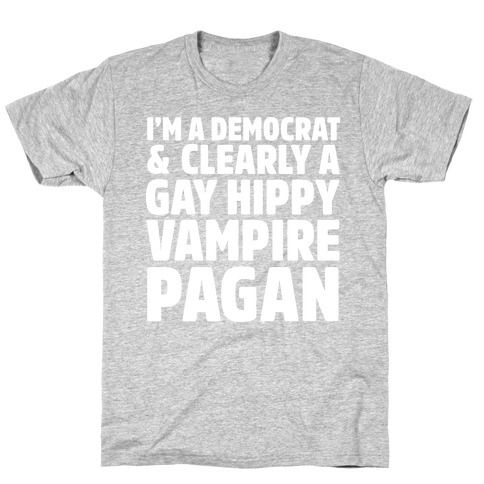 Shove that cartoonish image of democrats right in republican's faces with this political t shirt perfect for democrats looking to support their political party this election or for literal, actual, gay hippy vampire pagans just lookin to do what they do- be it support equal rights, save the environment, stay up all night, or do pagan stuff with their pagan friends. 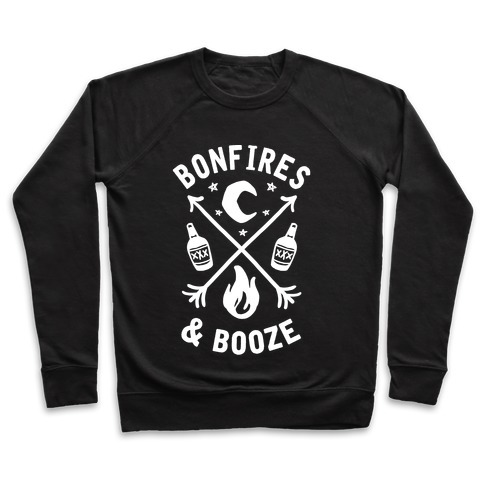 About this Design We're ready to have fall bonfires every weekend, but just like any other club there have to be rules set before anyone can join! Whatever happens late night around the bonfire, stays at the bonfire. No one needs to know what they did the next day. Grab this country bonfire shirt and let everyone know you're sassy and serious about rules. We're ready to have fall bonfires every weekend, but just like any other club there have to be rules set before anyone can join! Whatever happens late night around the bonfire, stays at the bonfire. No one needs to know what they did the next day. Grab this country bonfire shirt and let everyone know you're sassy and serious about rules. About this Design This cool country music shirt features the words "we can leave the night on" and is perfect for fans of country music, drinking whiskey, beer, and doing shots all night, Sam Hunt, good songs, good friends, good times, getting drunk, country music concerts, leaving the night on, mudding, hunting, fishing, and living that country life! 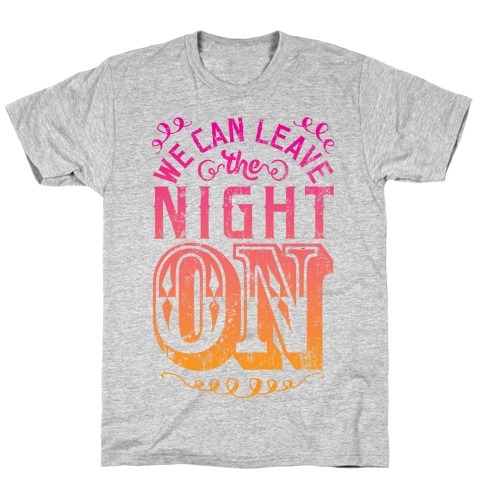 This cool country music shirt features the words "we can leave the night on" and is perfect for fans of country music, drinking whiskey, beer, and doing shots all night, Sam Hunt, good songs, good friends, good times, getting drunk, country music concerts, leaving the night on, mudding, hunting, fishing, and living that country life! About this Design This cool shirt features cool country flavor and the words "I can drink to that all night" and is perfect for country music star Jerrod Niemann and his hit song "Drink To That All Night" and is perfect for country music fans, going to concerts, muddin', drinking beer, doing shots of whiskey, getting wild at the bar, riding in big lifted trucks, tailgating, or just kickin' it in the sticks with your country friends! The country life - I can drink to that all night! 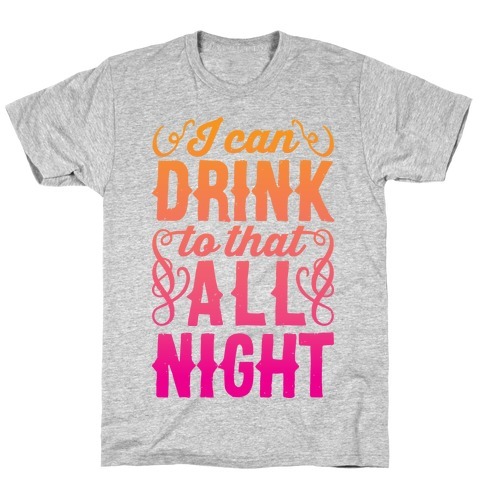 This cool shirt features cool country flavor and the words "I can drink to that all night" and is perfect for country music star Jerrod Niemann and his hit song "Drink To That All Night" and is perfect for country music fans, going to concerts, muddin', drinking beer, doing shots of whiskey, getting wild at the bar, riding in big lifted trucks, tailgating, or just kickin' it in the sticks with your country friends! The country life - I can drink to that all night! About this Design This tote bag is perfect for the cute country girl who loves a little moonshine in a mason jar around the fire at night. There isn't a better country party than with your best friends, because shared memories are the best around. Grab your favorite mason jar, fill them up and get ready to make memories you'll never forget! 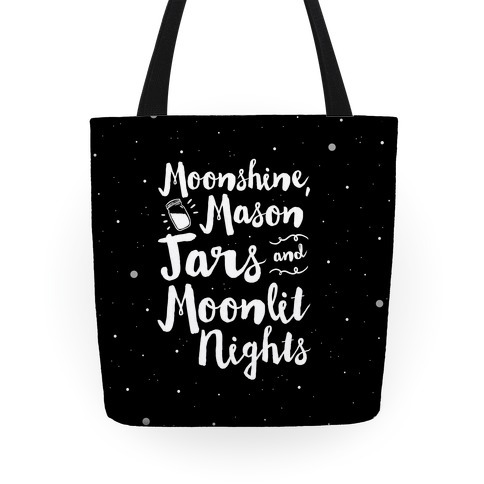 This tote bag is perfect for the cute country girl who loves a little moonshine in a mason jar around the fire at night. There isn't a better country party than with your best friends, because shared memories are the best around. Grab your favorite mason jar, fill them up and get ready to make memories you'll never forget! About this Design This shirt is perfect for the cute country girl who loves a little moonshine in a mason jar around the fire at night. There isn't a better country party than with your best friends, because shared memories are the best around. Grab your favorite mason jar, fill them up and get ready to make memories you'll never forget! 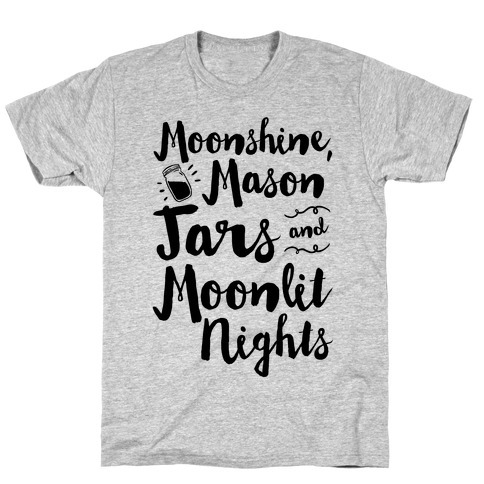 This shirt is perfect for the cute country girl who loves a little moonshine in a mason jar around the fire at night. There isn't a better country party than with your best friends, because shared memories are the best around. Grab your favorite mason jar, fill them up and get ready to make memories you'll never forget! About this Design This pillow is perfect for the cute country girl who loves a little moonshine in a mason jar around the fire at night. There isn't a better country party than with your best friends, because shared memories are the best around. Grab your favorite mason jar, fill them up and get ready to make memories you'll never forget! 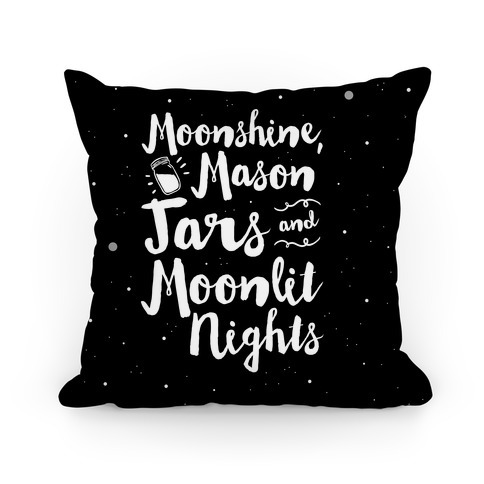 This pillow is perfect for the cute country girl who loves a little moonshine in a mason jar around the fire at night. There isn't a better country party than with your best friends, because shared memories are the best around. Grab your favorite mason jar, fill them up and get ready to make memories you'll never forget! About this Design Sunny days, starry nights & country life! Get the best of your country life with this charming shirt for your inner cowgirl! About this Design If it involves bonfires, summer, marshmallows and friends you can count me in! Don't count yourself out of these fun and fiery summer night activities! Gather around the summer campfire, roast some marshmallows and enjoy summer nights with your friends cuddled up with this cute, summer, camping pillow! 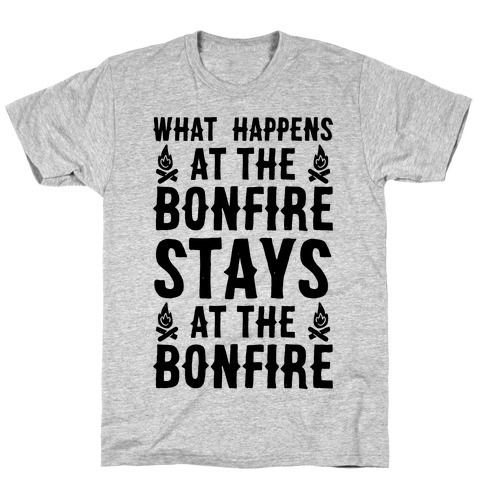 If it involves bonfires, summer, marshmallows and friends you can count me in! Don't count yourself out of these fun and fiery summer night activities! Gather around the summer campfire, roast some marshmallows and enjoy summer nights with your friends cuddled up with this cute, summer, camping pillow! 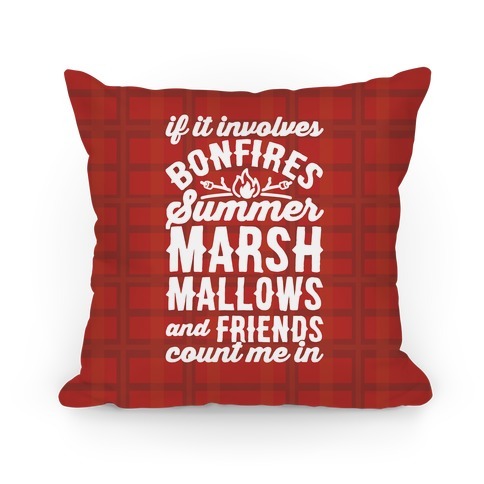 About this Design If it involves bonfires, summer, marshmallows and friends you can count me in! Don't count yourself out of these fun and fiery summer night activities! Gather around the summer campfire, roast some marshmallows and enjoy summer nights with your friends cuddled up with this cute, summer, camping blanket! 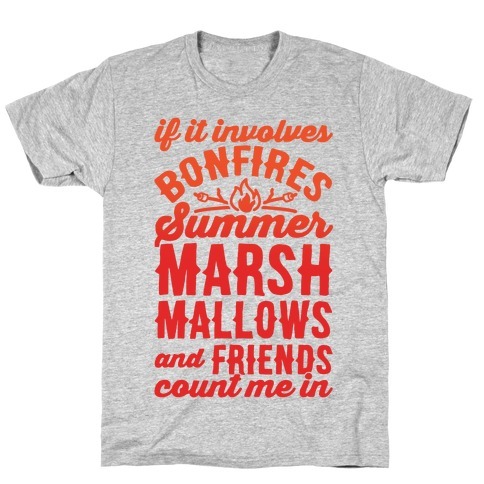 If it involves bonfires, summer, marshmallows and friends you can count me in! Don't count yourself out of these fun and fiery summer night activities! 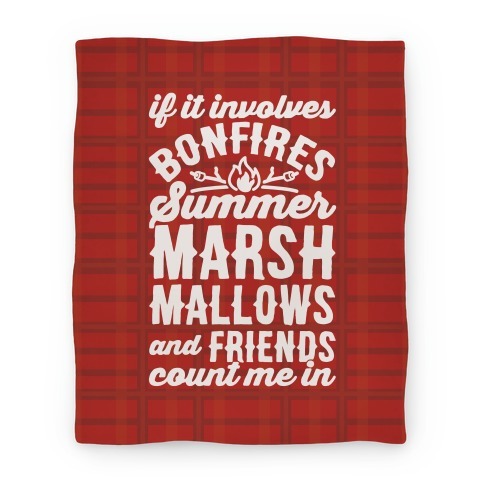 Gather around the summer campfire, roast some marshmallows and enjoy summer nights with your friends cuddled up with this cute, summer, camping blanket! About this Design If it involves bonfires, summer, marshmallows and friends you can count me in! Don't count yourself out of these fun and fiery summer night activities! Gather around the summer campfire, roast some marshmallows and enjoy summer nights with your friends in this cute, summer, camping shirt! If it involves bonfires, summer, marshmallows and friends you can count me in! Don't count yourself out of these fun and fiery summer night activities! Gather around the summer campfire, roast some marshmallows and enjoy summer nights with your friends in this cute, summer, camping shirt! About this Design This cool drinking and camping shirt features a crackling camp fire and the words "camp all day drink all night" and is perfect for exploring the great outdoors, climbing trees, visiting national parks, camping, pitching tents, starting camp fires, roasting marshmallows, making s'mores, drinking, hiking, rock climbing, or just sitting at school or work wishing you were outside! 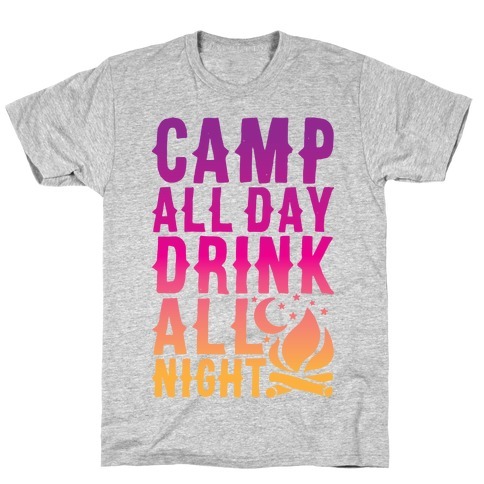 This cool drinking and camping shirt features a crackling camp fire and the words "camp all day drink all night" and is perfect for exploring the great outdoors, climbing trees, visiting national parks, camping, pitching tents, starting camp fires, roasting marshmallows, making s'mores, drinking, hiking, rock climbing, or just sitting at school or work wishing you were outside! 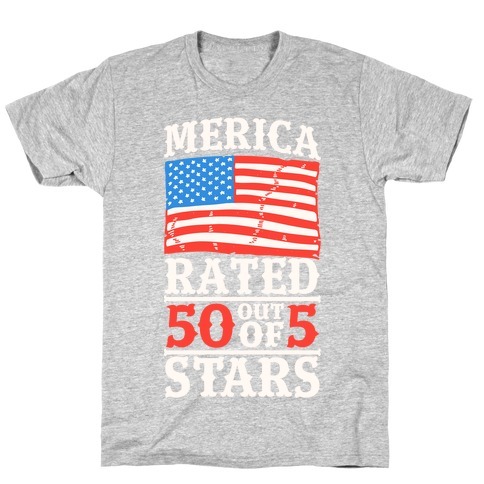 About this Design On a rating system of 5 stars the United States of America is rated 50/5 stars! Show your red white and blue, star spangled banner patriotism to the greatest country on Earth- 'MERICA - with this 4th of July t shirt perfect for summer cookouts, firework shows, baseball games, football games, tailgating, movie night, eating apple pie or drinking beer! On a rating system of 5 stars the United States of America is rated 50/5 stars! Show your red white and blue, star spangled banner patriotism to the greatest country on Earth- 'MERICA - with this 4th of July t shirt perfect for summer cookouts, firework shows, baseball games, football games, tailgating, movie night, eating apple pie or drinking beer! About this Design This cool summer party design features american flags and the phrase "if it involves fireworks, sumer nights, barbecues, beer, and freedom, count me in" and is perfect for people who love summer parties, lighting fireworks, celebrating freedom and America, and having an amazing Fourth of July! 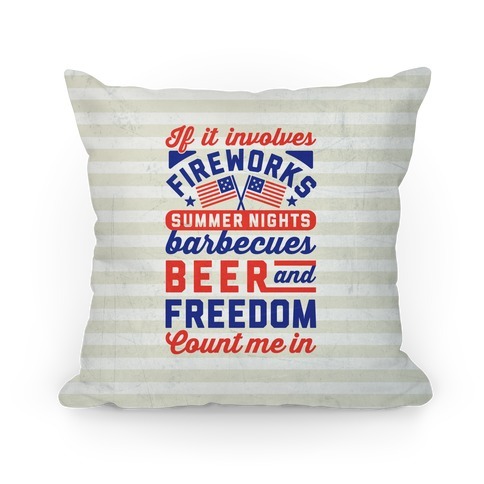 This cool summer party design features american flags and the phrase "if it involves fireworks, sumer nights, barbecues, beer, and freedom, count me in" and is perfect for people who love summer parties, lighting fireworks, celebrating freedom and America, and having an amazing Fourth of July!